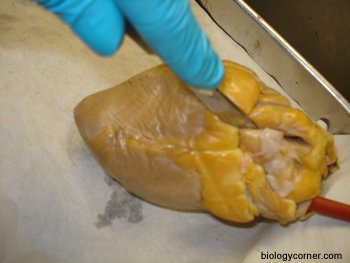 The heart dissection is probably one of the most difficult dissections you will do. 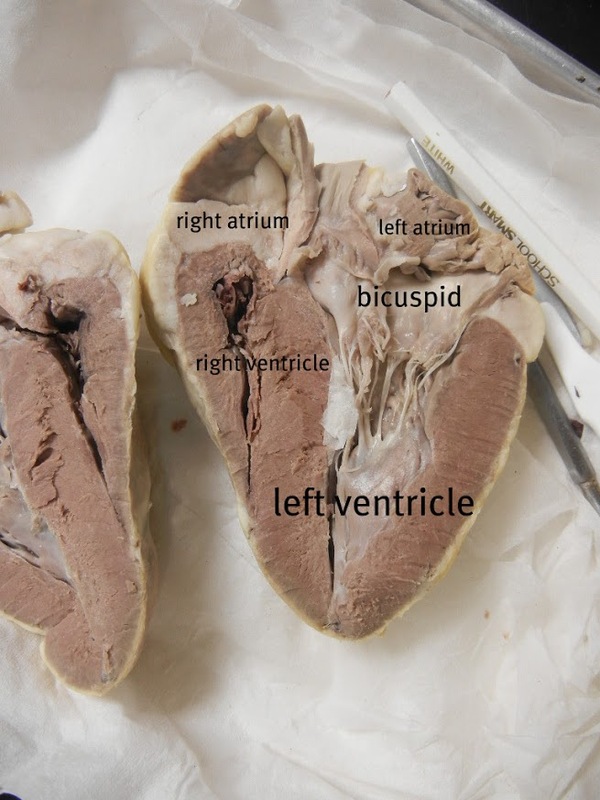 Part of the reason it is so difficult to learn is that the heart is not perfectly symmetrical, but it is so close that it becomes difficult to discern which side you are looking at (dorsel, ventral, left or right). Finding the vessels is directly related to being able to orient the heart correctly and figuring out which side you are looking at. The heart is also difficult because the fatty tissue that surrounds the heart can obscure the openings to the vessels. This means that you really must experience the heart with your hands and feel your way to find the openings. Many people will be squeamish about this, and because the heart is slippery, it is easy to drop. 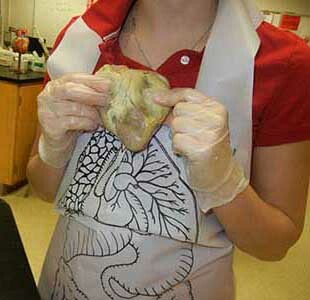 Don't be shy with the heart, use your fingers to feel your way through the dissection. When you first remove your heart from the bag, you will see a lot of fatty tissue surrounding it. It is usually a waste of time to try to remove this tissue. Grab some colored pencils to help you identify and mark the vessels you find. There are a few clues to help you figure out the left and the right side, but often the packaging and preserving process can cause the heart to be misshapen. If you are lucky, the heart will be nicely preserved and you will see that the front (ventral) side of the heart has a couple of key features: 1) a large pulmonary trunk that extends off the top of it 2) the flaps of the auricles covering the top of the atria. 3) the curve of the entire front side, whereas the backside is much flatter. 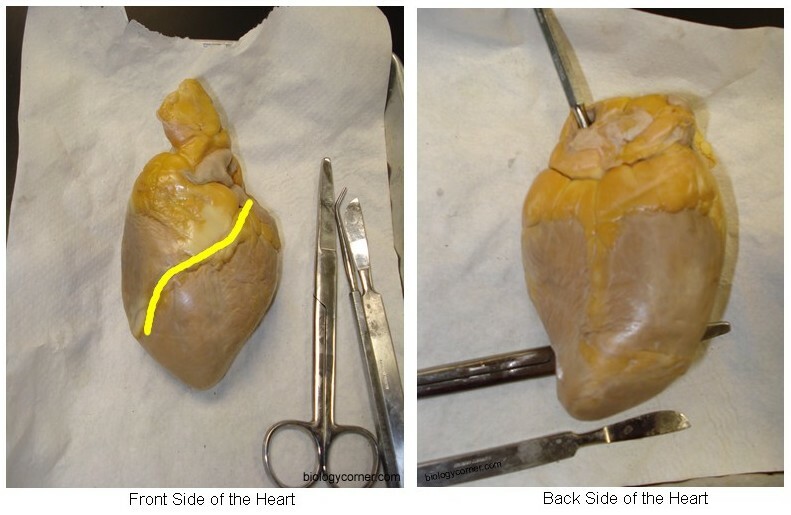 The first image shows the front side of the heart, often identified by the coronary sinus that runs cross it at an angle (yellow). The auricle is the flap that covers the atrium, it looks like an ear. 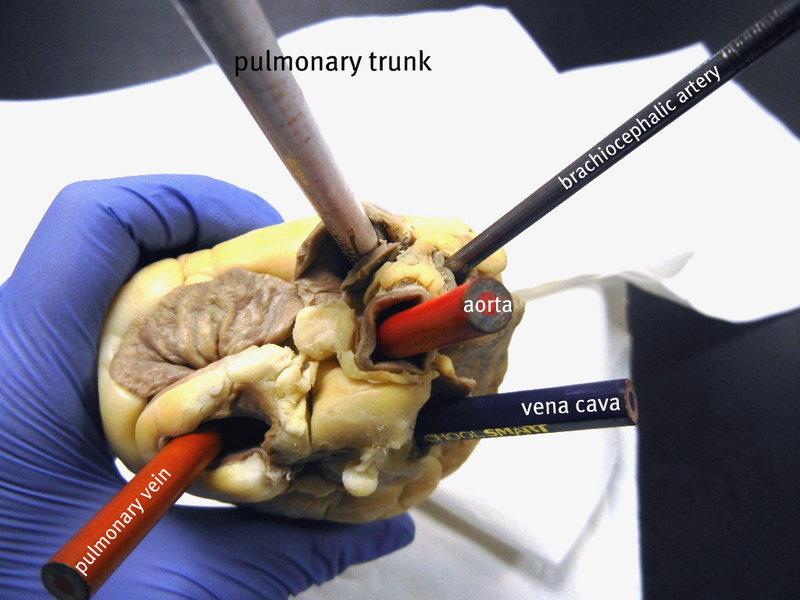 The pulmonary trunk is the located at the front of the heart and enters at an angle. Use your fingers to probe around the top of the heart. Four major vessels can be found entering the heart: the pulmonary trunk, aorta, superior vena cava, and the pulmonary vein. Remember that if you are looking at the back of the heart, then the right and left sides are the same as your right and left hand. This picture was on the board the day of the dissection so that you could glance up and recall which vessel entered which part of the heart. If you find the pulmonary vein, the aorta should be situated a little bit behind it. It may be covered by fat, so use your fingers to poke around until you find the opening. Push your finger all the way in and you will feel inside of the left ventricle. 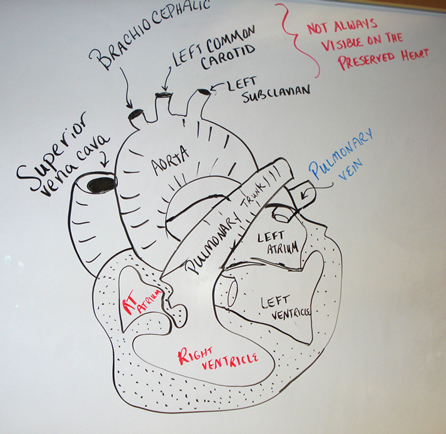 The left ventricle has a very thick wall, unlike the right ventricle. Insert your finger through the pulmonary vessel to feel the left ventricle and you will notice and feel that it is much thinner than the left side of the heart. With your fingers or probes in the aorta and the pulmonary trunk you should notice that they criss-cross each other, with the pulmonary trunk in the front. At this point, you may want to use your colored pencils to mark these vessels so that you don't get them confused when you are searching for the other two openings that top of the heart. The two major veins that enter the heart can be found on the backside, as both enter the atria. On the left side, you should be able to find the opening of the pulmonary vein as it enters the left atrium. The superior vena cava enters the right atrium. In many preserved hearts, the heart was cut at these points, so you won't see the vessels themselves, you will just find the openings. Again, use your fingers to feel around the heart to find the openings. If you've marked the aorta and pulmonary then you won't mistake them for the veins you are looking for. This picture shows all of the vessels labeled. Sometimes, the aorta still has its branches attached to it. There are three vessels that branch from the aorta: the brachiocephalic, left common carotid and the left subclavian. 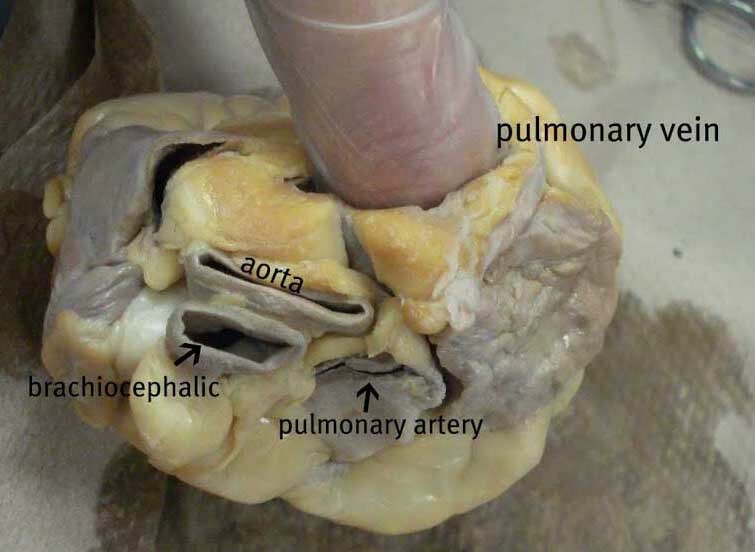 The majority of the time, these vessels are not visible because the aorta was cut too close to the main part of the heart when the heart was removed from the animal. Occassionally, you can find the brachiocephalic artery attached, as it is in this photo. Now that you have all of the vessels located and marked, you can now open the heart to view the inner chambers. Use the superior vena cava and pulmonary vein as guides for where to cut. You are basically going to be cutting each side of the heart so that you can look inside. 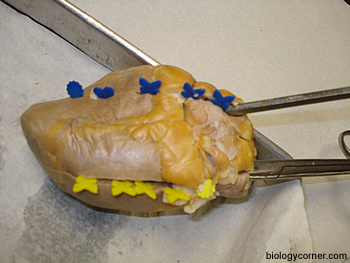 (Some dissections will ask you to make a coronal cut where a single cut opens the entire back side of the heart). The heart below is marked to show you where the two incisions should be made. Optionally, you may cut the heart in half to expose the chambers. My students affectionally call these two variations the "hot dog cut" as pictured above because it looks like a hot dog bun, or the "hamburger cut, where the heart is cut into the front and the back half, as shown below. At this point it is helpful to have two hands, one to hold the heart apart so you can take a peak inside of it and another to use a probe to locate the specific parts. Your colored pencils you used to mark the heart in step 2 can also now be used to see where those vessels connect within the heart. For instance, the aorta pencil can now be seen ending in the left ventricle. 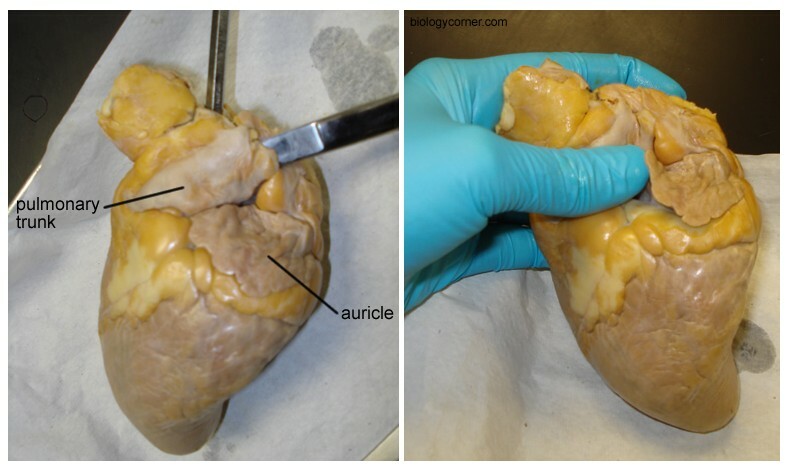 You can also now see how much thicker the walls of the left ventricle are compared to the right ventricle. 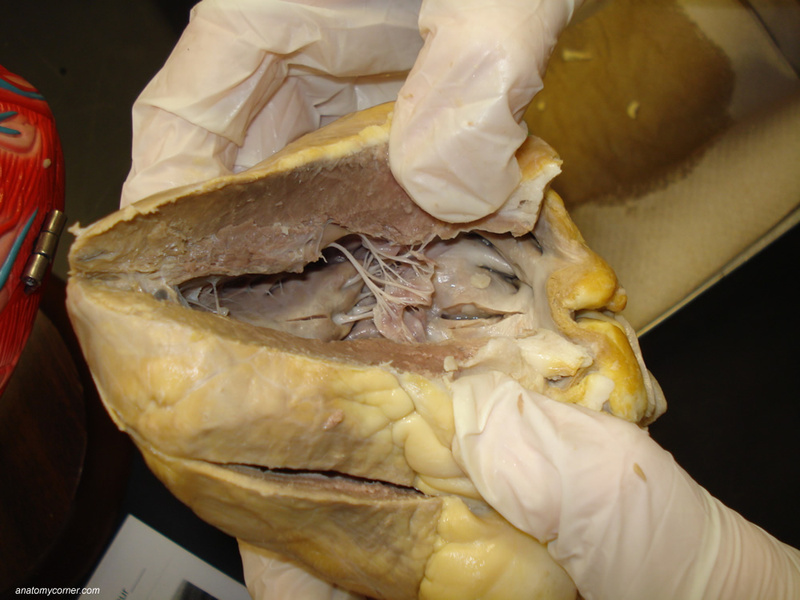 The other obvious structures seen within the heart are the chordae tendinae which are attached to papillary muscles. These tendons hold the heart valves in place, sometimes they are called the "heartstrings". 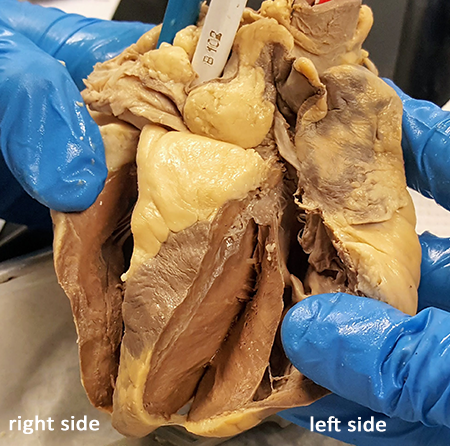 The valves were probably cut when the heart was opened, but if you follow the "cords" they should lead you to a thin flap that is the atrioventricular (bicuspid) valve. You can find a similar valve on the right side of the heart (tricuspid). 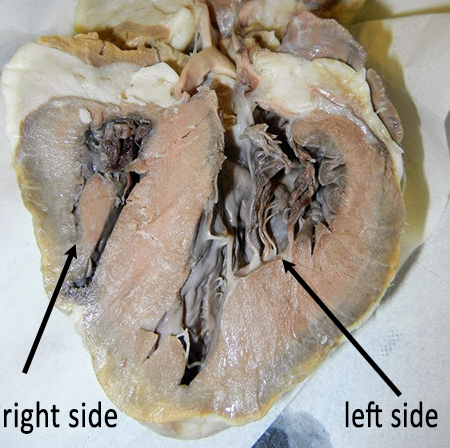 Image shows the left atrioventricular valve (bicuspid) and the chordae tendinae.